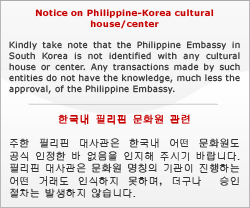 The Philippine Embassy in Seoul wishes to inform all Filipinos currently studying in South Korea that Woojung Education and Culture Foundation is offering financial assistance to Filipino students for the First Semester for the 2019 Academic Year. Woojung Education and Culture Foundation was established by Booyoung Group, one of the key construction companies in South Korea, with the aim to lend financial support to deserving foreign students currently studying Korea. Please note that interested students must currently be enrolled as an undergraduate / Master's / PhD student in South Korea, should have an 80-point (Grade B equivalent) scholastic average, and should have a good demeanor and be able to contribute to the society in the future. Qualified students must submit, personally or via postal mail, to the Embassy the following documentary requirements on or before Thursday, 24 January 2019: Application Form, Certificate of Admission, Certificate of Enrollment, Official Academic Record, Recommendation Letter from Dean or Professor, Self-Introduction, Study Plan, copy of Bank Account, and a Cover Letter addressed to Ambassador Raul S. Hernandez.